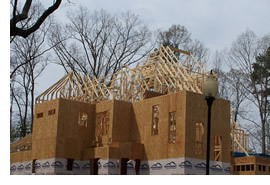 Structural building components are an environmentally sound, economical framing alternative created with computer technology to build the structure you desire. The vital natural resource is renewable and sustainable. Manufacturing components in shop allows for more efficient use of lumber. Building with components generates minimal waste - even the cut offs are easily used or recycled, in the manufacturing facility and on the jobsite. Components optimize lumber resources and are designed to precise load carrying capacities. Less labor involved in jobsite assembly, components can be installed quickly and efficiently.